I wanted to show my love and celebrate my Grandma by getting her dolled up and capturing her fun spirit. I had the absolute pleasure of capturing these birthday photos for my beautiful 95 year old Grandma for her birthday! Yes, 95! Can you believe how amazing and stunning she looks? My initial vision for the birthday photo shoot was simple and to snap a few photos of my Grandma a.k.a Mama to cherish in the years to come. However, when I reached out to a few local "friendors" and told them my vision they wanted to lend their creativity and talent and I couldn't be more grateful. I wanted a classic, vintage and elegant feel to the set. So naturally collaborating with Mother/daughter duo Leticia and Lucy of Le Petit Jardin Rentals was such a blessing! 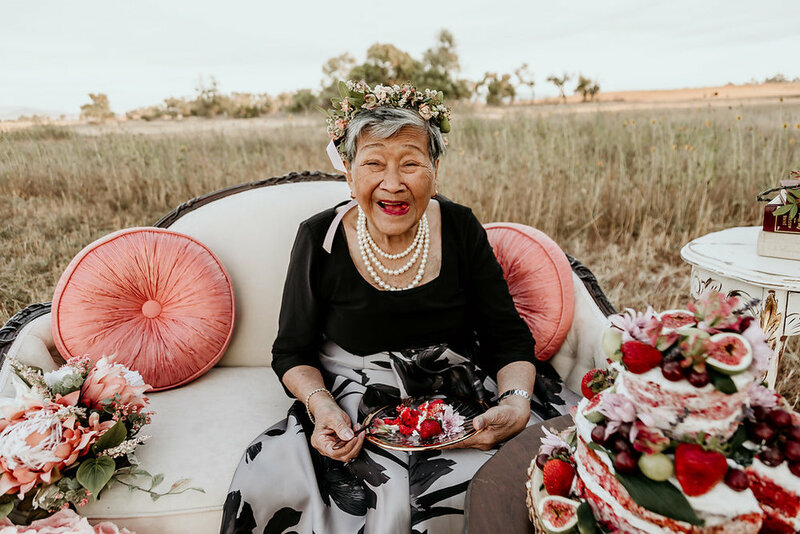 When I mentioned to Lucy that I needed a chair for my Grandma during her photo shoot, without any hesitation, Lucy said they would take care of it and bring a couple pieces to enhance the shoot. Much to my surprise when we arrived at the location of the shoot, the set up blew me and Mama away. As soon as she saw everything come together, she was in awe and couldn’t stop thanking me for making her feel like a “princess.” But honestly, she is the true Queen and this was only a piece of my appreciation for everything she has done and taught me in my life. From the amazing lounge set up to the delicate, handmade large pink and white peonies made by Leticia, the set up was stunning. I can not thank Lucy and Leticia enough for elevating Mama's birthday photo shoot with their creative vision for this set-up in just 24 hours! A princess wouldn't be complete without a crown! A flower crown to be exact. So I reached out to my friend, Alison, of New Creation Floral design. I have worked with Alison on past projects and knew she was the perfect person to bring my floral vision to life! Not only did she make 1 flower crown for Mama but she made 3 just because she is a floral boss like that! They were all so delicate and each design was different and beautiful. Lastly a party wouldn't be a party without an amazing cake! This was the first time working with stay-at-home- Mom, Miranda of Miranda's Sweet Treats and I was blown away with how delicious and moist this cake was. Originally, I wanted a simple traditional naked cake but 24 hours before the photo shoot, I decided I wanted a more unconventional cake that no one has ever seen before. I wanted something colorful, fun and sweet just like Mama! Even with the last minute cake design change, Miranda exceeded my expectations. The non-traditional naked cake is a moist strawberry cake (Mama's favorite flavor) made with a fresh strawberry puree with a buttercream frosting topped with fresh flowers and figs provided by Alison (New Creation Floral Design). The strawberries, green and red grapes as decor also elevated this non-traditional naked cake and the beautiful pink hue of the strawberry cake was not only pleasing to the eye but mouthwateringly delicious. If you’ve had the pleasure of meeting Mama Fe you know how wonderful, sweet and kind hearted this woman is! I am so blessed to be named after my Grandma along with my daughter, Michaella Fe. I would not be the person I am today without my Mama. She has taught me so much about life, family and how to be a great Mother. I thank God everyday for the precious moments we spend with her and how my children adore and love her so much and have all the wonderful memories we have ingrained in our hearts. To 95 more years of celebrations! We love you so much, Mama! Thank you to all the amazing vendors/friends I made while planning Mama’s birthday photoshoot.